The Turks have been always a cynosure due to their special cultures, traditions and customs during every stages of the history. One of the cultures special to the Turks are sport and wrestling cultures. Wrestling is one of the traditional and national sports of the Turks. It’s known that the Turks have wrestled since the 4th century BC. The wrestling contests were organized in the festivals, made for the celebration of the blossom of the nature in the spring, in the weddings ceremonies, and in the glory celebrations. In addition to the wrestling mat, which is known by the whole world, there are other types of wrestling only special to the Turks. The most important ones among the wrestling types, differentiating among regions, are oil wrestling, aba wrestling, karakucak wrestling, short baggy trousers wrestling and sinsin wrestling. These wrestling styles, dates back to centuries ago, have formed the basis and the infrastructure of the Turkish Wrestling and they have a big share in the world wide success of the Turkish Wrestling. It may be helpful to give short information about these wrestling styles, which are tried to live by the local administrations. With all aspects the oil wrestling has been fully a Turkish Sport. The pre-wrestling, the moment of wrestling, and the post-wrestling have an atmosphere of a festival. The oil wrestling was made also during the times of the Ottoman Empire under the control and protection of the state. Some of the Ottoman Sultans, like Sultan Murat IV and Sultan Abdulaziz, wrestled personally to show that, how much they attached importance to wrestling. It has been told that there were wrestling lodges, which had the old and famous wrestlers as their sheikhs. The most famous organization of the oil wrestling, which has been made at all places, Turks lived, since the immemorial, is the Kirkpinar Oil Wrestling arranged in Edirne. The Historical Kirkpinar Oil Wrestling has been going on without any interruptions since the year of 1357; that’s why it has taken its place in the Guiness Records Book as the oldest wrestling contest. Each year, many visitors, foreign or indigenous, go to Sarayici of Edirne to watch this wrestling contest in the last week of the June. There are many stories told about the beginning of the Kirkpinar Oil Wrestling. According to the most famous one among the other stories, this wrestling contest has begun when the Turks arrived at the Anatolia in the 14th century. A Turkish army troop crossed over the European peninsula (Rumeli), and they spent the night in the neighborhood of Edirne. Because of wrestling being both a Turkish tradition and preparation for war, forty valiant men out of the troop started to wrestle on a Hidirellez Day. Although they had wrestled all day long, neither of them could beat the others, until the end of the day. Besides, they didn’t give up the wrestling; such that, all of the forty valiant men were exhausted by overexertion. It has been believed that they died martyrs and were buried at where they had died. When their friends came to their graves the next day, they saw forty springs emanated from each forty graves where the soldiers were buried. Then, this place was named as Kirkpinar and wrestlers has been coming together to wrestle in memoriam of the forty wrestlers in Hidirellez Day of each year since that time. As a result, the Kirkpinar Wrestling starts. The wrestlers wear a cloth, made of the leathers of the water buffalo and the calf and closing their body between the knee- cap and the hub, in the oil wrestling contests; and this special cloth is named as “kisbet”. There are caldrons of water and oil for the wrestlers to be oiled when they decide to try their powers on the Valiantness Arena and they undressed and wears their kisbets. The wrestlers oiled each other by the side of the caldrons, too. The wrestlers, who need to be oiled in the game, can demand the oil from the “oiler” who wanders with his ewer on his hand in the arena during the whole game. However, in accordance with the traditions, the opponent allows the wrestler to go for the oil or cloth. The Cazgir, who is also like a speaker of the wrestling contest, matches the wrestlers and starts the game saying “Allah Allah Ill Allah” with prayers, salavats, and ritual idioms. On the other hand, drum and clarion are played melodies, which make the audiences excited. There are only a few sport contests like oil wrestling, accompanied by music, in the worlds. In recent years, some sports like rhythmic gymnastic and ice skating are accompanied by the music, too. The drum and clarion players excites both the audiences and the wrestlers with the melodies of wrestling and battling. When one of the wrestlers starts a movement designed to throw his opponent off guard, the drum and clarion players accelerate the music tempo; as a result, they try to speed up the game and make the audiences more excited. Each year, there are 15 “kat” (set) of drum and clarion teams in Kirkpinar. The wrestlers in the oil wrestling are not separated according to their weights, on the contrary, according their experiences and capabilities. Shirt (level) is very important for the wrestling, that is to say the experience. The lowest group is tozkoparan (encouraging) and the highest group is “head”. The wrestler, who plays to take the head and wins, gained the most important appellation, namely he becomes head wrestler. Between the highest and lowest levels, there are also the bundle, the little, the middle, and the head below. After the Cazgir, who presents the games, finished his prayers, the matched wrestlers begin to pesrev (prelude). Although Pesrev is done for warming up before the wrestling, it carries very valuable meanings. 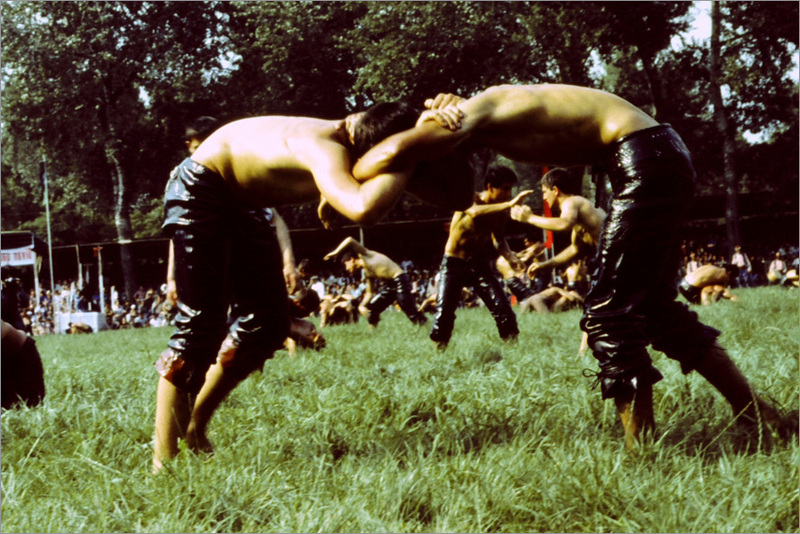 The wrestlers immediately accelerates, claps their hands to each other, and greets the audiences, while at the same time they go at a slow pace forward in ranks. This greeting is done with a temanna towards the ground. After that ritual, the rivals approach to each other and they touch to the other’s heel by approaching their hands to their heads. This movement has the meaning that “You’re a great wrestler. Your place is above my head (I have a great respect for you). I can’t even be the dust on your heel.” There are other movements in different meanings belonging to the pesrev like praise and thanks to Allah, surrounding the opponent on his waist and lifting him weighting by cutting his feet from the ground, and caressing the opponent’s back by wishing him success. After donating their rights (helallesmek) to each other, the wrestlers begin the game by wishing success to each other. The plays and the counter-plays made by the wrestlers to win are putting their arms to each other, shepherd’s binding, inner stake, outer stake, gerdanlama, paca kasnak, inverse net, a wrestling hold, awn, kolbasti, and kemanede asirmak. There isn’t the condition of the back waiting as laid on the ground for a little while, in the traditional oil wrestling, a little touch is sufficient for the defeat. The wrestler is accepted as defeated when his back touches the ground (fall), when his hub sees the stars, when his two elbows touch the ground, when his one elbow touches the ground while his falling, when he falls backward leaning his hands to the ground, when he falls over one hand but uses the other hand while turning his body to the other direction, when he is hugged without binding his feet to each other and turned, where he is, in a circle or brought as hugged for three steps, when he is fallen over his head called nail over position, when he is disqualified due to his fault on purpose, when his ““kispet”” takes off or tears, even if he is not on purpose, and when his treatment or unconsciousness take long time. When some wrestlers, who understands they are going to be defeated or simply are tired, and if don’t want their backs to lay down the ground, they beat softly to his opponent’s “kispet” or say “I give up!” This is called the giving up. The wrestler falling due to his mistake or his opponent is accepted defeated by falling open. The wrestler, who catches the rival at his feet, puts him up over his head and laying his back to the ground, wins with “nail over”. The wrestler, who hugs his opponent by cutting his feet from the ground and walks at least three steps, wins with “win by weighing”. Karakucak Wrestling is special to the Turks and it’s their national wrestling. 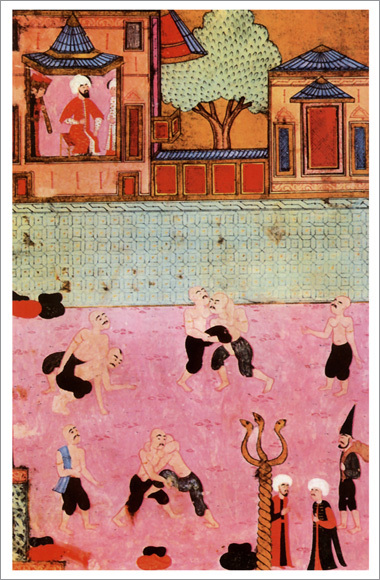 Originating from the Inner Asia, this wrestling is preserved with only little changes from the past to the present day. According to some researchers, this wrestling is made for 10 centuries. 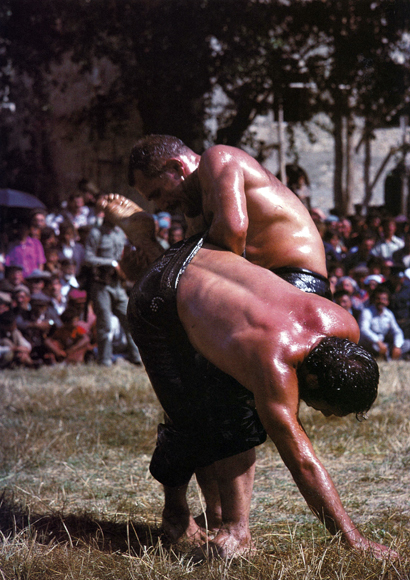 The Karakucak Wrestling is made on the swards, earthen ground and on the thresher floor. Karakucak or with another words freestyle wrestling is known and executed by all Turks like the Yakut Turks, the Mongolia , from Azerbaijan to Eastern and Western Turkistan, and the Kazak and Crimean Turks. The Karakucak Wrestling, which is the same as the wrestling of Oguz tribes and old Turks, is common in the regions of our country, where the oil wrestling is not widespread. Many Turkish wrestlers, winning the championship of the Olympiads and world, begin wrestling with Karakucak, like Yasar Dogu. It’s one of the important organizations of the weddings, festivals, fests, and cultural festivals. The Karakucak Wrestling is accompanied by the music, too. The “kispet”, worn in Karakucak Wrestling, is called pirpit in some regions. The difference is only due to the local naming. Pirpit is generally made of the canvas. It’s never sewed leather on the hoop part of the pirpit. Besides, there isn’t allowance to oil any parts of the body. The wrestlers are barefoot. The Karakucak Wrestle has brought in great champions to the Turkish Wrestling in reel terms since 1925. Due to the being alike the freestyle wrestling, Karakucak is arranged in the festival wrestling and Turkish Championships with respect to ten levels like the mat wrestling. In addition to these, the mat rules are nearly applied and by giving tolerance of 1 or 2 kg, the appropriate contest attention is displayed. The Karakucak Contests are managed by the national arbiters, who have international careers, are members of the Central Board of Arbiters of the Turkish Wrestling Federation and categorized as high arbiter. The Karakucak Regulation was prepared by the Wrestling Federation and the matches are organized in Turkey in accordance with this regulation. The most widespread areas of the Karakucak Wrestling are Kahramanmaras, Sivas, Tokat, Corum, Amasya, Ankara, Adana, Mersin, Kayseri, Samsun, Artvin, Erzincan, Malatya, Erzurum, Kars, Yozgat and in their neighborhoods. When it’s looked at the history of the wrestling sport, it is understood that the oldest wrestling style is the Aba Wrestling. This wrestling style was applied by the Iskits, Sakas, Uygurs, Karahans, Mongols, Uzbeks, Kazaks, and Cagatays and developed especially among the Kizik Turks, settled in the region of Gaziantep and Antakya, in Turkey. The Aba Wrestling is one of the first wresting styles, performed with clothes. Using for battling and military education in the Inner Asia, this wrestling sport was taught to the Chinese by the Turks in the 4th century BC. Moreover, the Judo, one of the far eastern martial arts, although having little differences with Aba wrestling, is the modern version of the Aba Wrestling. Again, it is estimated that “the trousers” wrestling in Sweden is taught for the first time by the Hun Turks, who settled down to the Baltic region during the migrations from the Inner Asia. The Aba Wrestler wear a cloth, which is woven of the sheep wool and goat hair at the handlooms, is without collar and sleeves, is strengthened with the leather on the shoulders and the back, and has a length to the knees of the wrestler; that’s why this wrestling is called the Aba Wrestling. According to the traditions, the aba is accepted as the common property of the village people. 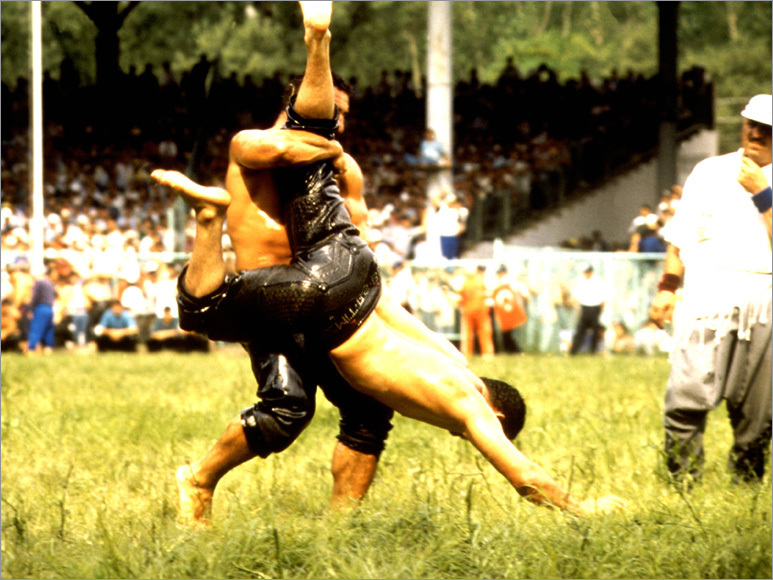 There are 2- 3 aba in the villages, where the aba wrestling is widespread. There are many kind of aba and the major ones are Domestic Aba (Red Aba, Groan Aba), Maras Aba, Hamis Aba, Broadcloth Aba, Black Aba, Urfa Aba, and Grandchild Aba. The wrestlers wear the aba. Belt is bound around the waist of the wrestler. They wrestle with barefoot. Especially in the wrestling organizations in the villages, the wedding owner invites all wrestlers in the neighborhood by sending messengers, with respect to the local dialect by “SENDING READOUTS”. The wrestlers coming from the neighborhood are hosted in the village during the wedding. 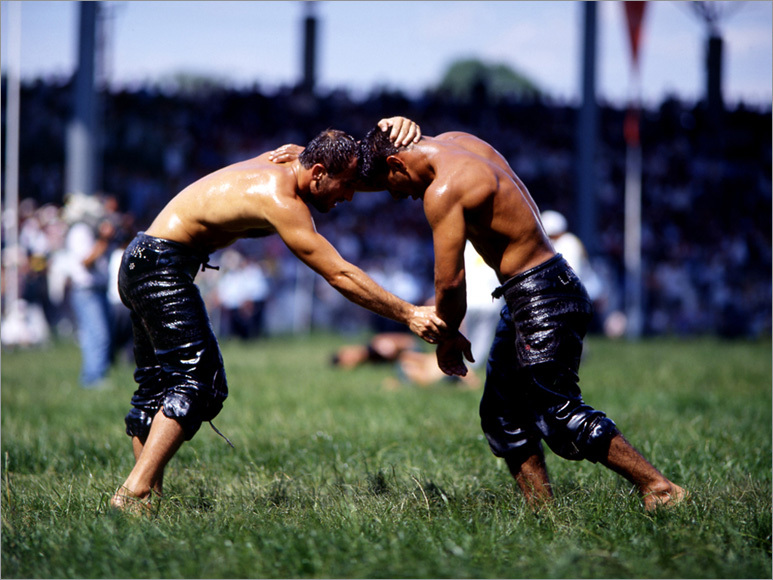 The wrestling is made on the village square and sometimes it may last for a week. The villagers watch the matches by constituting circles around them. The most important difference, which separates this wrestling from the other ones, is that there aren’t any cheers and applauses for the wrestlers, whether he is the winner or the defeated, and whether the cheers and applauses are in favor of the wrestler or against him. If there were cheers and applauses for a wrestler, the villagers find it very strange and disapprove. The match duration is generally seven minutes in the Aba Wrestling, which is continued hardly on the ground. The Aba Wrestling, being a folkloric wrestling, is accompanied by the drum and clarion. With respect to the organization style of the wrestling contest, there can be 6- 7 drums but the number of the clarions is always two. One clarion is for playing the melody of the wrestling, and the other one is for rhythm. There are some differences among the Aba Wrestling performed in Hatay, Kahramanmaras, and Gaziantep regions, with respect to the application of the sport. The one, belonging to the Hatay region, is like the wrestling performed in the Inner and Northern Asia and in the Caucasian in according to all aspects. A very important feature of this wrestling is the participation of the women, especially of the Inner and Northern Asia Turks, according to the old Turkish traditions. Another important aspect of the Aba Wrestling is its similarity with the mat wrestling technically and physiologically. The Aba Wrestling by Propelling is special to the Gaziantep Region. The wrestling threshing floor continues to be established every year. The Aba Wrestling by Propelling is different from the other ones in terms of it techniques and its appearance and the wrestlers wrestle according to their ages. The wrestlers try to hold their opponents on their belts and to throw their opponents over their own head to the other side by propelling him. The wrestler, who achieved this movement for two times, wins. The Gaziantep Metropolitan Municipality has organized the Aba Wrestling by Propelling Contest for the last thirty years to be able to provide the maintenance of this wrestling style. For this reason, the municipality founded a facility 12 km away to the central city. There are plays to dominate the opponents like hand propelling, inner hook, and outer hook in the Aba Wrestling. The wrestler, who propels and holds the opponent’s belt, is accepted as defeated, as soon as he quits the belt. The wrestler, who falls, falls open (over his face), or of whom hip or shoulder touches the ground, is accepted as defeated. If the back or flank of a wrestler, making a movement by throwing the opponent backward, touches the ground, this wrestler loses, either. When the wrestler, propelling his opponent on the belt, falls, and his feet cut off the ground during this movement, the wrestler, propelling, is defeated. - The propelling wrestler can’t quit his opponent’s belt. - A wrestler can beat his opponent’s feet. - The propelled wrestler can’t put his head from the armpit to the chest. - The propelling wrestler can’t attack his opponent one or double by quitting his belt. - Holding below the knees is forbidden. - The wrestler, who surrounds his opponents by blocking him, can’t squeeze his neck. - The wrestler can perform dangerous plays, like breaking, to his opponent by opening his arms more than 90 degree. - The winning or the defeated wrestler can’t be applauded by the audience. - The hand propelling should always be made by using the right hand.